Fox has picked up The Simpsons for a 20th season, which will tie it with CBS' Gunsmoke as the longest-running scripted prime-time series. Marshal Matt Dillon and doofus Homer Simpson otherwise share only a fondness for cold beers at town saloons. 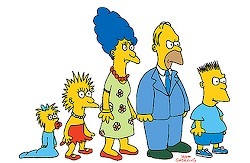 Created by Matt Groening and adapted from his comic strip, The Simpsons originated as snippets on one of Fox's four charter series, The Tracey Ullman Show. They first set out on their own with a Dec. 17, 1989 Christmas special subtitled "Simpsons roasting On An Open Fire." 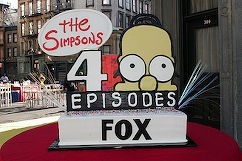 The show's 400th episode, "You Kent Always Say What You Want," aired on May 20, 2007, with the first Simpsons feature film released in July of that year. ***CBS' annual telecast of Broadway's Tony Awards, on June 15th, will be spiced with a sizable contingent of star presenters, including Glenn Close, Liza Minelli, Alec Baldwin, Laura Linney, John Lithgow, Mary-Louise Parker, Brooke Shields and Marisa Tomei. Hosting for the first time is Whoopi Goldberg.